As I get older (and a little heavier) I am noticing that shirts that fit well elsewhere, drive me crazy around the neck. I remember my mom saying the same thing, so it is probably hereditary. (Will they ever isolate the gene that makes a person feel like she is choking with any collar that rides above the collar-bone?) I can’t stand turtlenecks or mock turtlenecks, but even regular t-shirts make me feel like I am choking. Here’s three ways to finish necklines. 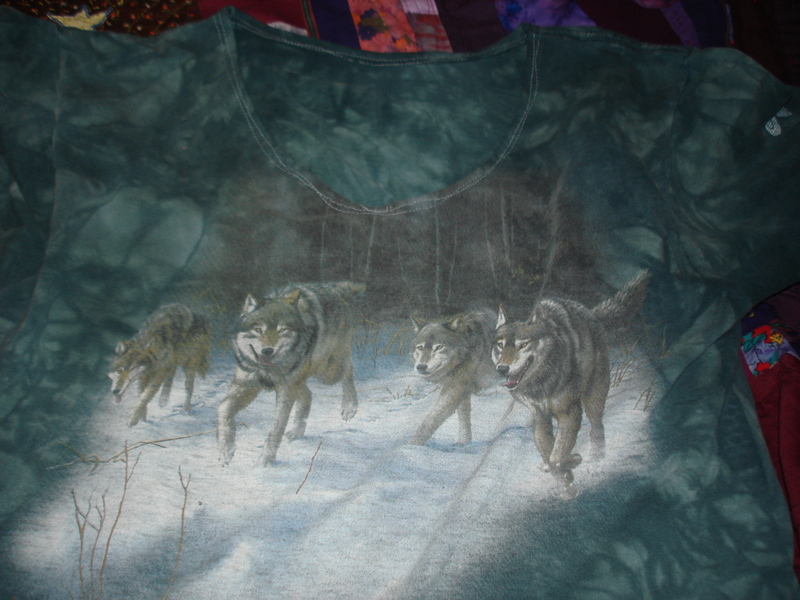 This was actually Paul’s shirt. He’s now big enough that I can fit his cast offs! Anyway, I liked the tie dyed background. The neck was just too tight. So I cut off the neck part plus a little extra. Then I turned the edge under and sewed it with a wobble stitch. A wobble stitch is a zigzag with a regular length and a width of one half. It will be just enough stretch so the stitches won’t pop. Since I sewed it really crooked and didn’t match my thread, I sewed twice around just as crooked to make it look like I did on purpose. On this sweater, I did the same thing. It was a mock turtleneck. I felt like the neckline just made me look heavy. I cut off the turtleneck. 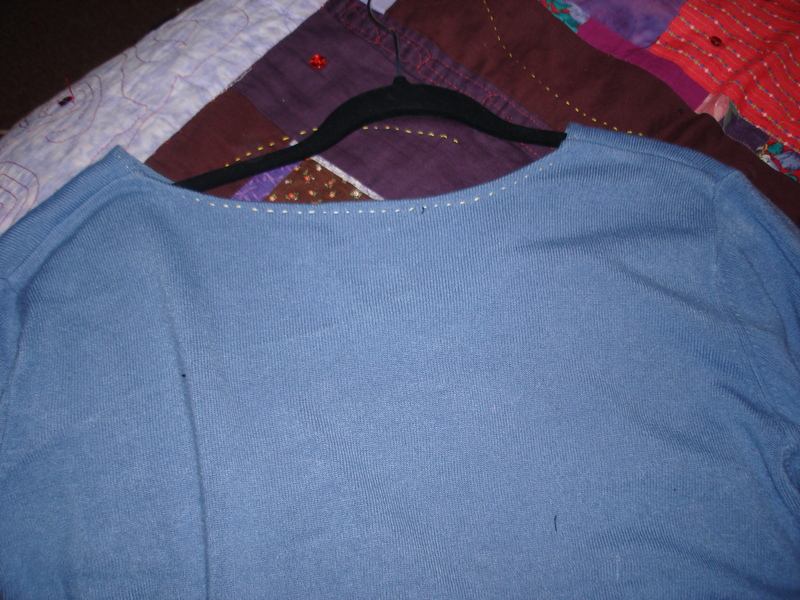 Then I tucked the edge under and hand sewed with perfectly matching thread. I tried not to go through the front and I really ended with an invisible hem. The neckline is now jewel. It it acceptable, but I wish I would have made it a little deeper. I make sure when I do hand sewing on knits that I no longer need the stretch. One way to do this is to make the neck hole large enough to put my head through without stretching so I don’t pop my stitches. This third one is influenced by the Alabama Stitch Book by Natalie Chanin. I used very thick thread in a contrasting color. Again I just folded the edge under and sewed around the edge. Again, I made sure my neck hole was very big so my stitches won’t pop. These are really simple changes that make my clothes a lot more comfortable. If it is genetic, we’re related! Oh, my goodness! We must be related too, then! lol! Thanks for the great alteration tip! Ditto. 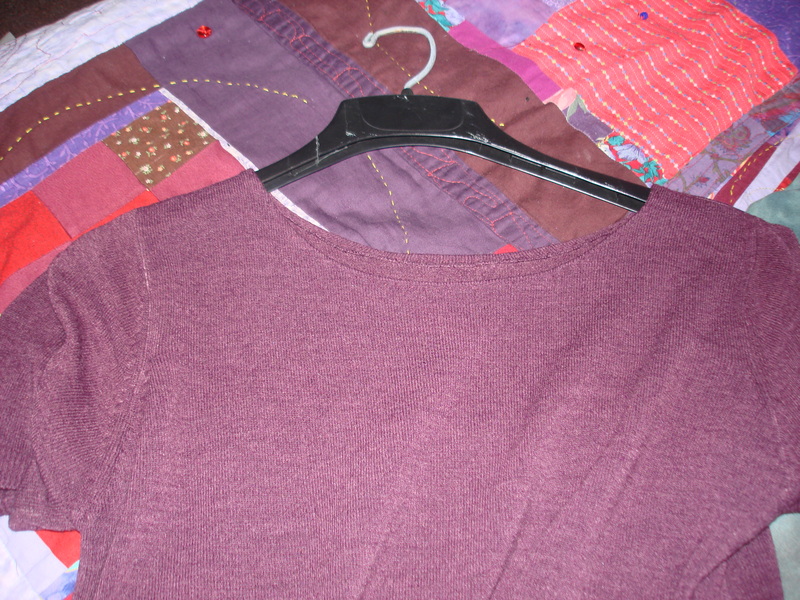 A friend showed me on a basic t-shirt (think Hanes or Fruit of the Loom) how she turned down the ribbing and stitched it down. Makes a world of difference! Thanks for the tip! I definately will try it. It sounds like an easy but very finished look.